The sports stadium of secondary school №6 in Kstovo underwent complex reconstruction with the financial support from RusVinyl LLC. The solemn opening ceremony of the renovated sports ground was held on September,5, within the frame of the events, dedicated to Kstovo Day. After the reconstruction, the new infrastructure of the school stadium comprised the ground for mini-football, volleyball court – basketball court and training ground, housing gym equipment.Besides, the modern day track zone with three individual jogging tracks and sectors for hundred metres race and long jumps was constructed along the perimeter of the sports complex. News facilities were arranged with artificial safe coating and equipped with protective barriers. Besides, the sports stadium is equipped with exercise devices for pupils with disabilities. Apart from that, the stadium underwent replacement of the illumination system and the area landscaping works were performed at the cost of Kstovo authorities. Kstovo and Kstovo area leaders, RusVinyl LLC representatives, school teachers, pupils and their parents took part in the sports event. When delivering a speech at the opening ceremony, Kstovo Head, Aleksey Kovalenko, highlighted that at the moment in the country much attention was paid to sports, traditions of hitting USSR’s qualifying standards: ready for labor and defense, regenerate and arrangement of new sports ground – is a big step in this direction.«On behalf of our group of teachers, pupils, parents and citizens of the micro district I would like to thank you for the attention, benevolence, which you provided in respect of our school», -directed the words of thanks director of school №6, Galina Vaschanova, to the company’s management. 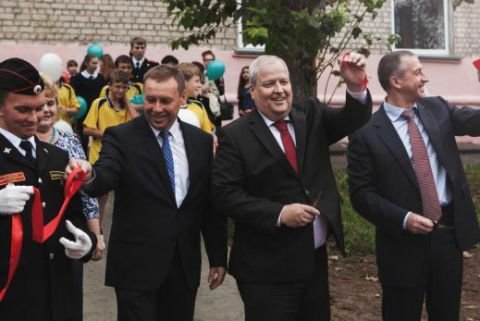 Deputy Director of education department of Kstovo area, Alexander Dolgikh, highlighted that it was a great and desirable present for the school. As RusVinyl CEO, Guenther Nadolny, remarked, having become a part of Kstovo, the Company continued to implement socially significant projects and to carry out charitable activity in support of Kstovo and Kstovo area: «Completion of the large-scale reconstruction of the school stadium – is a wonderful possibility to support development of children’s sport and healthy lifestyle».